Online videos have revolutionized the way companies promote their products. With faster Internet connections and advanced media playback software, online video is now easier to access than ever. Not sure if video marketing could help your business? Keep reading to learn the top 10 benefits it has to offer. The next time you perform a search on Google or Bing, check to see how many of the results are video. Most of the major search engines have been including more videos in their search results, whether it’s from YouTube, Bing Videos, Daily Motion, etc. In fact, studies show that 70% of the top 100 listings in Google consist of video. Well, making video a part of your overall digital marketing efforts allows you to take up more search engine real estate while subsequently reaching a larger audience. Social media networks offer the perfect platform to share content, and videos are no exception. According to an infographic published by MarketingTechBlog, more than 700 YouTube videos are shared on Twitter every minute of the day! And that’s only counting YouTube and Twitter. Users share videos from other platforms on other social media networks. The bottom line is that social media users love to share videos with their friends and family. They offer a fun and engaging form of media that connects with the viewer. A study conducted by MarketingCharts found that more than 60% of consumers spend at least two minutes watching a commercial video about a product they intend to purchase. If a consumer is interested in buying a new fitness tracker, for instance, they may search for video reviews on YouTube. It’s a quick and easy way to gain deeper insight into the product. And using this information, the consumer can make a better decision on whether or not to purchase the product. Can’t seem to get recipients to click the links in your marketing emails? Try adding a video to it. By including a video in your emails, you can increase click-through rates (CTR) of emails by as much as 96%. Furthermore, videos can increase open rates of emails by as much as 5.6%. Want more information on CTR? Click here. Video isn’t a one-way street; it encourages the viewer to interact by leaving comments. All of the leading video platforms support viewer comments, allowing the viewer to converse with the video author as well as other viewers. Of course, this increased level of audience interaction offers several key benefits, such as greater transparency, increased conversion rates, and even the potential for higher search rankings. Each time a viewer leaves a comment, it adds fresh, new content to the video — content that search engines love. Ask any seasoned Internet marketer and they will agree: analytics are critical to the success of an online marketing campaign. If you are unable to see where your customers are coming from, and whether or not your ad campaign is effective, you won’t be able to optimize it for higher conversions. The good news is that video is measurable, allowing digital marketers to track key performance indicators like views, average time spent watching the video, clicks on call-to-action (CTA), conversions and more. Using this information, you can optimize your videos to generate a stronger response and more conversions by your target audience. For YouTube videos, visit youtube.com/analytics to learn more about metrics and analytical tracking. When you publish a video online, it becomes immortal so to speak, allowing people to view it for years to come. Nearly all of the leading video platforms, YouTube included, do not remove users’ videos unless there’s an issue (e.g. copyright infringement). After all, it’s in their best interest to keep videos running, as this drives traffic to their respective platforms. So whether it’s one month from now or five years from now, your video will remain in place, promoting your product or service during this time. Not surprisingly, videos can prove useful in boosting the conversion rates of landing pages. If you have a landing page that is designed strictly for selling a product or service, try adding a promotional video to it. 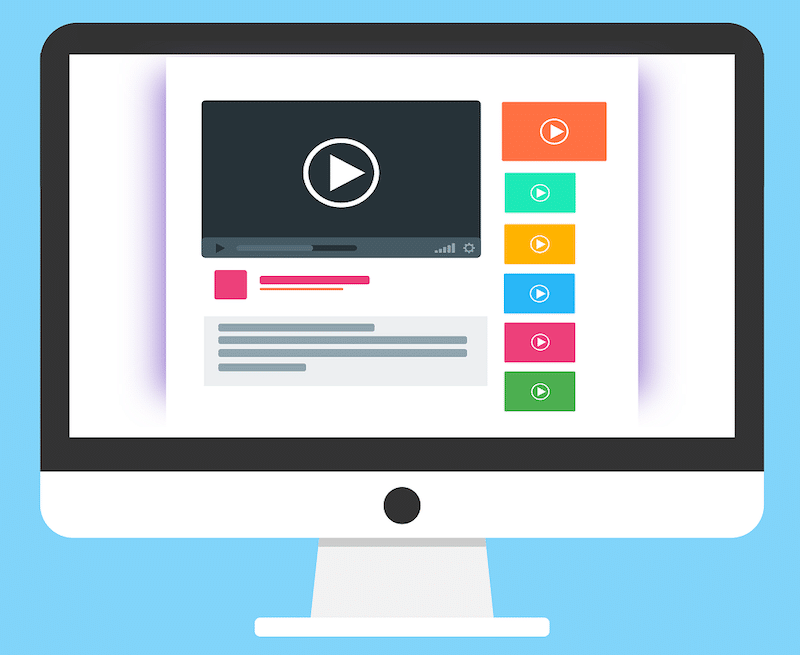 One study found adding videos to landing pages could increase their conversion rates by as much as 80%, which is pretty impressive, to say the least. While there’s no guarantee you’ll experience the same results, adding a video to your landing page can prove helpful in encouraging visitors to take action. Contrary to what some people may believe, you don’t need an expensive camcorder and video editing software to produce stellar marketing videos. In fact, many digital marketers create videos using nothing more than their webcam or smartphone camera. If your computer has a built-in webcam, click record and start talking. Alternatively, you can use your smartphone to film videos of outdoor environments and settings. These are just a few quick and easy ways to create marketing videos. Here are some more tips for getting your YouTube video seen! The tech industry estimates that people use smartphones and tablets for more than half their Internet searches. But just because a website loads and functions in a desktop browser doesn’t necessarily mean that it will do the same in a mobile browser. Mobile devices have different screen sizes, different browsers and different operating systems. And these can lead to compatibility problems. But the good news is that video is mobile-friendly, allowing users to watch and enjoy videos on all platforms, both desktop and mobile. What are your thoughts on video marketing? Let us know in the comments section below! Want to explore other ways you can grow your business with digital marketing? Schedule a free business growth call here and find out how we can help! Online videos have revolutionized the way companies promote their products and services. If you're skeptical of video marketing, keep reading to learn the top 10 benefits it has to offer. If you have the capabilities to create a video for your product or business definitely utilize that advantage. Just make sure it is a high quality video worth sharing. Dennis has a good point. If you create video marketing it has to be sharable. By this I mean it needs to be worth watching and sharing on social media by the viewers of the video. Videos are great but they do take a lot of time. I would recommend either hiring a good videographer or motion graphics expert. If you would like to try your hand yourself at producing the video, take a few courses either online or at your local college to learn the programs. Videos are much more engaging than static copy. When done well they are a great marketing tool. What I love about videos is that you can either share them or embed them across a multitude of platforms which makes them appealing to a variety of media outlets and audiences.